They also suggested there was “nothing wrong” with a similarly contentious outcome, which saw Evgeny Tishchenko defeat Vassiliy Levit. 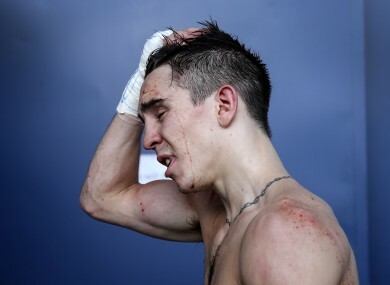 Ireland's Michael Conlan following his defeat to Vladimir Nikitin of Russia. INTERNATIONAL BOXING ASSOCIATION (AIBA) President Ching-Kuo Wu has hit out at the behaviour of Michael Conlan at the Rio Olympics. Conlan was the subject of a highly controversial defeat at the Games, with most observers feeling he had done enough to win his bout against Vladimir Nikitin. After his loss, Conlan raised his middle finger to the judges and branded AIBA “f*****g cheats” among other criticisms. In an interview with the Associated Press, Wu also suggested there was “nothing wrong” with a similarly contentious outcome, which saw Russia’s Evgeny Tishchenko defeat Kazakhstan’s Vassiliy Levit. Contrasting the Kazakhstan boxer’s loss to Conlan, Wu said: “(Tishchenko) never said anything. (Levit) never said anything. They all accept the result. But (Conlan), he immediately showed his finger to the referee-judges. “The IOC says this is totally unacceptable. You cannot humiliate people. They are officials. He put himself in a difficult position, I can tell you. A lot of disciplinary action will follow. You should show proper behavior. “If you are not happy about the result, you cannot humiliate in public our referee-judges. That has already drawn a lot of people’s attention who want to punish him, so we are going to have a disciplinary commission for the case. “You can go through the right channel to say, ‘OK, may I have the chance to really review this bout?’ We do have the ability to review. This bout particularly, with his behavior that drew a lot of attention, we wanted to review whether it’s correct or not. “Judges have no intentions. Why do (you think) they hate your country? The judges, why do they want it in favour of this (country) over the other one? There’s no reason. “But since that happened, we want to totally review our system, how to improve in our mind. Maybe five judges will score all fights, and all scores will be open. No more computer selection. Wu also dimissed accusations of corruption in amateur boxing. “People accusing AIBA of corruption, please give me the evidence. I have no mercy to those (corrupt) people. I hate manipulation, corruption. You will see how severe punishment I punch to those people. Really! People say corruption. What corruption? “I have no salary. I am absolutely a volunteer. Everybody knows I’m only working for sport. I don’t have an account, nothing. Even if people wanted to give me money, I have no account. I don’t need money. I don’t like it. “A lot of reform and changes happened because I hate corruption. I will immediately punish the people involved in corruption or taking money. “Maybe (corruption) happened 10 years ago with the old administration, my predecessor (Anwar Chowdhry), but that is no more. During that time, I watched carefully, and that’s why I already removed four vice presidents, now three secretary generals, six executive committee members. Wu’s comments come as Olympic boxing was left teetering on the brink of crisis at the Olympics with several fighters complaining they were the victims of bad judging decisions and a few alleging more sinister wrongdoing. The boxing body previously acknowledged that “less than a handful of decisions (were) not at the level expected” and sent home an undisclosed number of judges and referees. And a day later it “reassigned” one of its top executives who was in charge of helping run the Rio Olympic boxing. National boxing federations have so far been reluctant to criticise the AIBA, but Boxing Canada broke ranks with a strongly worded statement, warning that the sport’s integrity was in serious jeopardy and hinted plans were afoot to force AIBA’s arm. “Following questionable decisions and alleged corruption claims occurring at the Rio 2016 boxing competition, a global strategy is being put in place to ensure AIBA will address and correct the situation,” Boxing Canada said. It told AFP that it wants a “complete review” of what unfolded in Rio. AIBA did not respond to a request for comment. AIBA made headlines when, just two months before Rio, it said that professionals would be allowed to compete for the first time in Olympic boxing history. It had already dumped the unpopular punch-counting method of scoring bouts in favour of a judging system like that used in professional boxing and removed headguards for men, leaving some fighters nursing nasty head wounds and facial cuts. These three moves were designed to make Olympic boxing closer to the pros and hence more popular. In the event, only three professionals of debatable calibre took part and they all went home early. The fact the little-known pros never made it to the podium made a nonsense of criticism from some quarters that the rest of the field was in danger at the hands of the supposedly more adept pro fighters, AIBA said. The AIBA also said that while the controversial move to let pros take part at the Olympics was made in time for Rio, it is only in subsequent Games that its real impact will be seen. Back in the ring, the United States men won their first medals since 2008 but failed to get gold, as Cuba clinched titles in three of the 10 men’s weight classes. American hot prospect Shakur Stevenson had to make do with silver after a split-points loss to Cuba’s Robeisy Ramirez — he now holds two Olympic titles at two different weights. It will not stop the 19-year-old Stevenson turning pro under the tutelage of Floyd Mayweather, who says the bantamweight will be a world champion. Claressa Shields of the US and the Briton Nicola Adams successfully defended their titles, while Estelle Mossely celebrated her 24th birthday by becoming the first French women’s Olympic boxing champion — and her fiance Tony Yoka won super-heavyweight gold. Email “'You cannot humiliate people' - AIBA hit back at Michael Conlan”. Feedback on “'You cannot humiliate people' - AIBA hit back at Michael Conlan”.